The thing about whole wheat pasta is it needs a sauce that can hold its own against the thick, nutty noodles. Delicate butter sauces need not apply, what this pasta needs is a bold, flavorful pesto, to transform it from something that is tolerated to something that is enthusiastically devoured. But not just any pesto will do. 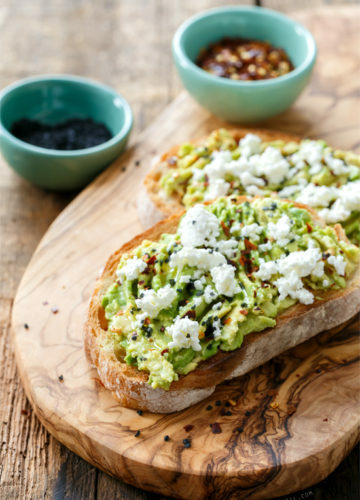 Technically speaking, pesto is a generic term for anything that is made by pounding (as it is traditionally made with a mortar and pestle, from which the name derives). While it is most commonly made with basil, I wholeheartedly believe that anything green can be made into pesto. Ok, maybe not green apple jolly ranchers, but any leafy green, vegetable, or herb. Pick your plant, pick your nuts, add some cheese, olive oil, seasoning, and voila! Pesto. I’ve made pesto with spinach and beet greens, asparagus and kale, but my favorite version, aside from the traditional basil, is most definitely arugula. This particular iteration also contains cherry tomatoes, making it somewhat of a hybrid between traditional Genovese pesto and trapense (or Red Pesto, a variation from Southern Italy made with almonds and tomatoes). Pistachios instead of almonds to enhance the vibrant green color and nutty flavor, a splash of lemon juice to offset the spicy arugula, and of course, red pepper flakes (totally optional, of course, but I love the addition of spice to my pesto). 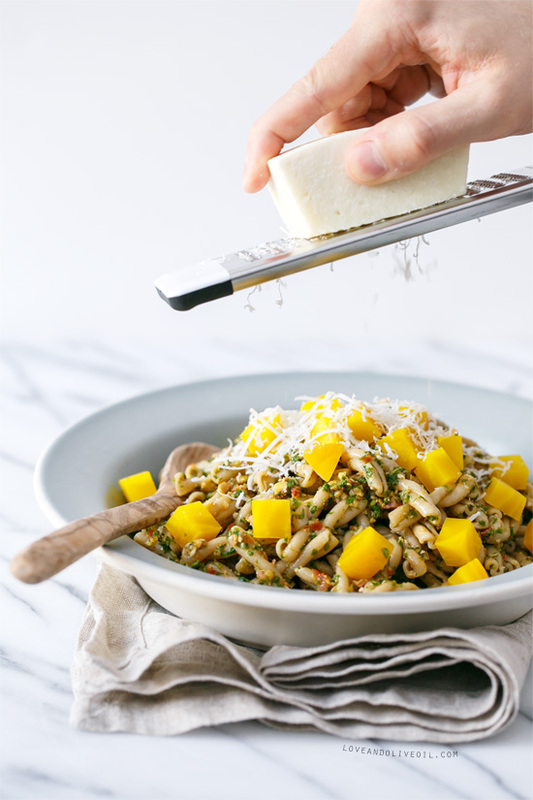 While you can substitute a good quality Parmigiano Reggiano (an aged cow’s milk cheese with a decidedly nutty flavor), Pecorino Romano, which is made with sheep’s milk, has a more potent flavor and salty finish that I find holds up better to the strong flavors of this dish. Preheat oven to 400 degrees F. Rub beets with olive oil and sprinkle with salt and pepper. Wrap beets in aluminum foil. Place on a baking sheet and bake for 30 to 40 minutes or until tender. Let cool slightly. When cool enough to handle, rub beets with paper towels to remove skin (it should come off cleanly), then slice into 1/2-inch cubes. Bring a large pot of salted water to a boil. Cook pasta according to package directions. Drain, reserving 1/2 cup pasta water, and set aside. 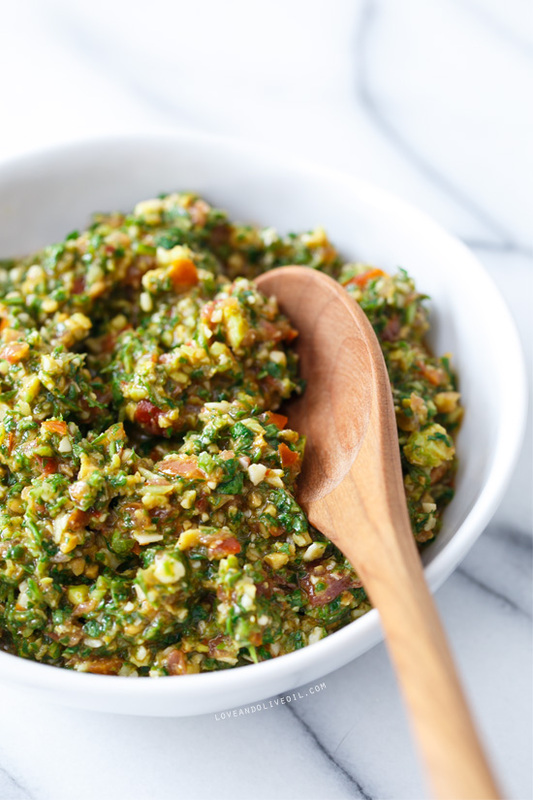 To prepare pesto, combine tomatoes, arugula, pecorino cheese, pistachios, and garlic in the bowl of a food processor. Add lemon juice, red pepper flakes, sea salt, and pepper. Pulse until finely chopped. 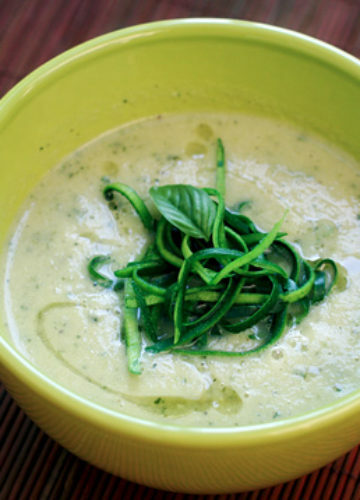 Drizzle in olive oil, and puree until smooth, scraping down the sides of the bowl as needed. Toss pesto with pasta, adding a splash of reserved pasta water as needed to help the pesto coat the pasta evenly. Divide among serving bowls. Top with beet cubes and additional pecorino cheese as desired. Serve warm or at room temperature. This pasta is GORG! I love all things carbs and all things pesto and even more all things cheese. However, I have never had a golden beet so I clearly need to fix that. Pinned! This pasta looks fantastic! Beets are hit and miss with me, but I think they are perfect in this dish! wow! what a delicious recipe!! looks SO good!!! I’ve never eaten beets (always been kind of weary), but this dish has me wanting to try them badly! 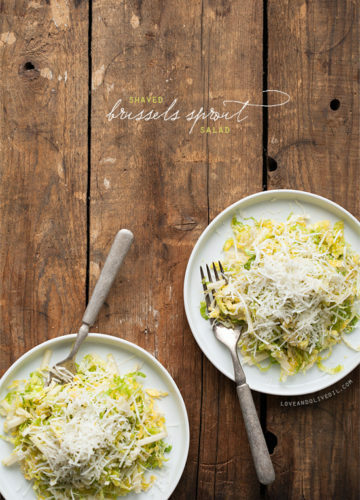 Pesto is one of my favorite additions to a dish and I can’t wait to try it! YES to arugula pesto. 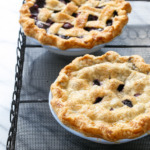 I adore its peppery bite, and I can imagine how yummy it is with the whole wheat. 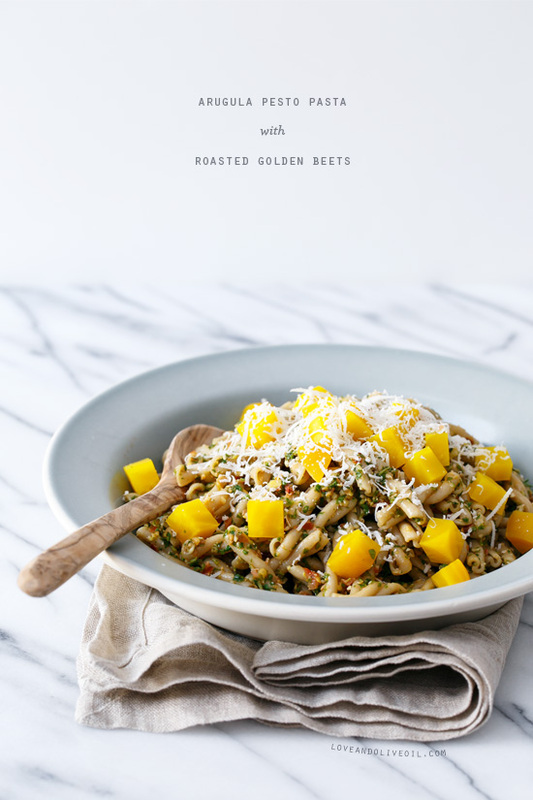 Those golden beets look like pretty little jewels. I want to reach in and pick ’em right off! Yum! I have some arugula in my garden I was just thinking needed to be used in something. I think this pesto is going to have to be that something! 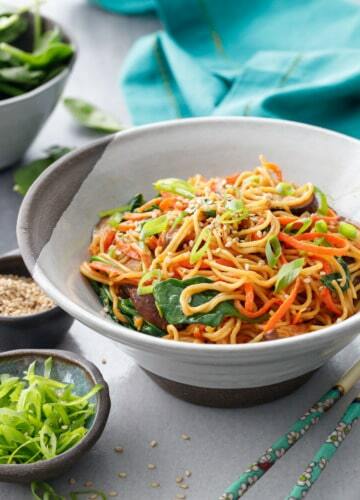 This dish is just stunning, and I love all of the flavors you’ve got running through it! I actually love whole wheat pasta – it just feels so much heartier. After going to whole wheat, I couldn’t go back to white wheat pasta. Trader Joe’s spaghetti is delicious. I’m right there with you on arugula pesto. I even like it more than traditional basil pesto! I was turned off from beets once before, and I’ve never had them since, but I would to try these. They look so pretty! I have never cooked with beets… I’m a little intimidated for some reason – but this might make me take the plunge. What a beautiful dish! Love Pesto and the addition of the beets! A great way to get someone to try beets for the first time. I love whole wheat pasta. Not more or less than white pasta, but differently. I eat it ds to be tasty with other things I should be eating more of. The tricks to whole wheat pasta are that it’s not the same food as white pasta, and it’s not as shelf stable. If you get whole wheat pasta that’s been on the shelf for ages, it’ll be pretty gross. And you have to pair it with things that go well with the bold flavor of whole wheat. Like this pesto. Arugula pesto was the first thing I ever enjoyed on whole wheat pasta. Mac and cheese is also a good gateway recipe if you use a sharp cheese. DeLallo is a pretty tasty brand. The Trader Joe’s and Whole Foods house brands are also fine. Barilla is inedible. Vita-Spelt and the Einkorn one are very good. Vita-Spelt is a milder flavor. Oh my, that pesto looks absolutely fantastic! It also reminds me that I haven’t made pesto in ages and really need to. This dish is gorgeous and I love the flavors. The beets + pesto sound awesome! I love arugula. Something about that flavor that makes me sit up straighter! I am also quite fond of whole wheat pastas. Toss in those golden beets, which I just became aware of this year and I think we have a winning recipe Folks. 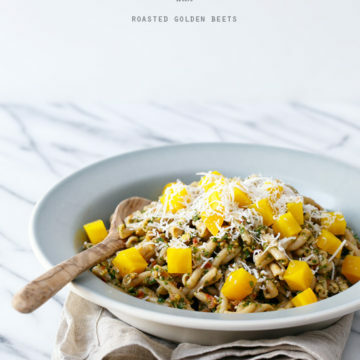 i love that you used golden beets.. they make the pasta look really vibrant and delicious. definitely taking the recipe to recreate at home in my kitchen.. the vegetarians in my household would appreciate it. thanks! Full of my favorite things! This looks gorgeous! Lovely! I’ve never thought about using Arugula for pesto. Brilliant idea! I have a bunch of arugula in my fridge right now and I was just sitting here wondering what I was going to have for dinner tonight! Ding ding ding. 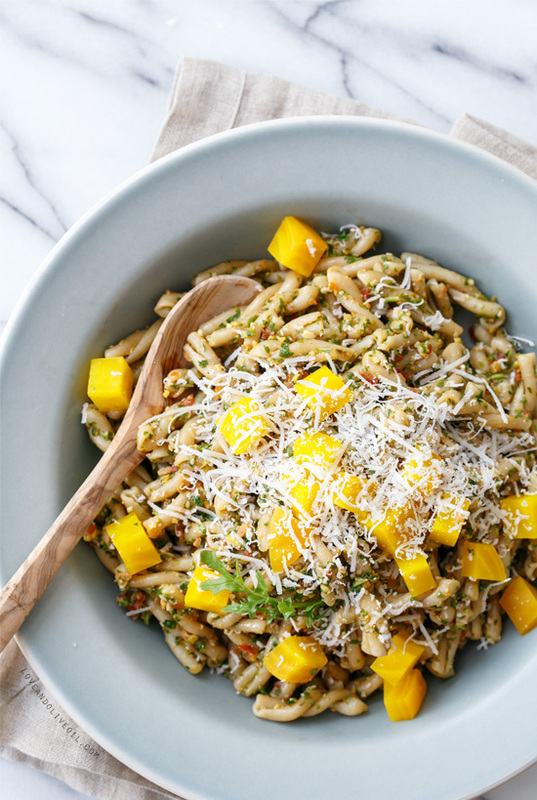 Pasta with arugula pesto. 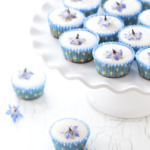 I’ll have to improvise a bit with the rest of the ingredients, but the idea is great! Thanks for posting. I’ll let you know what i substituted. This was so good!! I added some spicy Italian Sausage because my husband “needs” meat for dinner…with our without would have been fabulous the pesto was delicious!! Thanks for the recipe! This was superb. I substituted pistacchios eith almonds and beets with carrots (thats what i had at hand) with spectacular results. Best pasta ive had in a loooooong time.